Time travel movies are always fun in a headache-inducing way, and none would seem better suited for it than director Tony Scott. Scott (Domino, Man on Fire) has a kinetic, almost ADD-like method where he over edits his work, creating a sense of action. Images shift quickly, explosions are loud, and the camera moves like crazy. Deja Vu never quite reaches its potential - it is more a police investigation with a slight twist, but it can be an enjoyable ride at times. It's predictability causes the movie to drag at times, especially late in the second act of the film. A ferry explodes in New Orleans, and with the aftermath of Katrina and 9-11, everybody is especially nervous. The investigation kicks into overdrive, and ATF Agent Doug Carlin (Inside Man, The Manchurian Candidate) discovers enough to suspect some sort of terrorism. He begins to investigate, which piques the interest of Agent Pryzwarra (Val Kilmer, Kiss Kiss Bang Bang, Alexander), who works for an undisclosed agency. Pryzwarra enlists Carlin's help in finding the bomber by using his own special techniques - he has a time machine. Scott and screenwriters Bill Marsiliii and Terry Rossio (Pirates of the Caribbean: Dead Man's Chest, The Legend of Zorro) give a cursory explanation of how Pryzwarra and his team created the machine, but never try to convince the audience how the machine works. It makes the movie a bit unbelievable, straddling science fiction and action, but it doesn't bog down the movie, freeing Scott to do what he wants - nifty looks into the past. The machine can look at anything four days into the past. It cannot look more, and cannot look less. Thus, Carlin has four days to solve the bombing, by trying to track down the bomber before he does it. However, nothing can be as easy as this. Claire Kuchever (Paula Patton, Idlewild, London) washed up dead on shore. From the way she died, everything looks as if she died in the bombing. However, Kuchever's body washed up on shore two days before the bombing. Stranger is that on her answering machine is a message from Carlin himself. 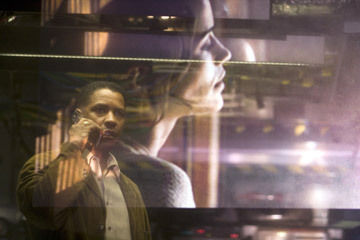 As he begins to investigate primary suspect Carroll Oerstadt (Jim Caviezel, Bobby Jones: Stroke of Genius, The Passion of the Christ), he realizes that the two may be connected, so he starts watching Kuchever. Unfortunately, this means that part of the time, the viewer is watching Washington watch a big screen. To amend this, Scott throws in a ridiculous (but action-filled) segment where he takes remote camera with a small battery pack in his backpack in order to follow Oerstadt's actions in the past as he moves out of range. This is just after the movie informs everybody that it takes a huge amount of power to use the machine. Oh well. Logic is not necessarily Scott's strong point, and usually his movies (with Enemy of the State being the best example) have so much going on that people are distracted and fail to notice. 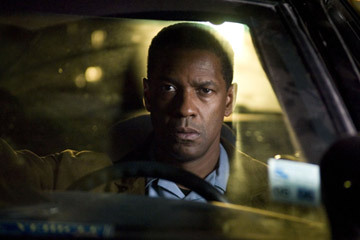 Scott and Washington worked together before on Man on Fire. Washington is not as intense here, he's just a detective working under some interesting circumstances. 2 hours, 6 minutes, Rated R for intense sequences of violence and terror, disturbing images, and some sensuality.